ALL TRAILS ARE CLOSED. 2019 WORK DETAIL CREWS ARE MONDAYS & WEDNESDAYS. 2019 TRAIL CHECK DETAIL YET TO BE DETERMINED PER MOTHER NATURE! 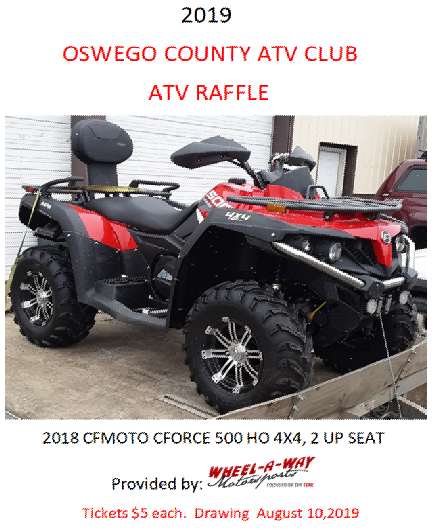 Welcome to the internet home of the Oswego County ATV Club. We are a club of individuals dedicated to giving its members a good, legal place to ride in Upstate New York. The over 100 miles of trails consist of mainly low effort, family oriented trails. There are some mud bog areas, woods, fields, railroad beds, bridges and small hills to climb. There are picnic spots with tables and shelter. All of the trails are environmentally friendly and we take great measures to ensure they stay that way. We welcome ATVs and utility machines. Our club is family oriented, and our riders ride safely and respectfully. The membership cost is listed on the membership form. A membership runs for the calendar year and trails are open by Club notice at the April Meeting, pending trail conditions and close September 30th. Maps are available at the Altmar Hotel or the Altmar Union Station store in Altmar. Club members can buy fuel, park and off-loading right at the store. The other location to find our maps is thru our membership person, Becky Hilton. She is at every function and brings plenty of maps with her. Sorry, we do not mail maps. No Excessive Speeds. Maximum speed on all roads is 25mph, 15mph within Village Limits, 10mph at any Residential Trail Areas. No Atv Riding after 10pm. Club Member yearly stickers MUST be placed on the front left, drivers side of Atv's, Utv's, and Dirt Bikes. Stay on trails means, stay on trails or stay home. Do not bypass our bridges and stream crossings by going up and down streams or mud holes. Do not go around wet holes and make them bigger, it causes more work and expense. If you do not want your machine to get muddy then it is best to keep it in the garage. You must try to make work details or work at events. It is your duty as a Club Member to report any other rider that is not obeying the Club rules and State laws. It is your duty to help keep our trails clean and safe. If you see debris on our trail, such as cans, bottles, cig. packs, etc., pick them up. Report any unsafe conditions to the Board or line officers, such as Beaver Dams, Flooding, Wash Outs, Fallen Trees, etc. Those that do not go by the rules will be brought in front of the Board. Depending upon the seriousness or the amount of violations, you may be barred from the club. Loud, tuned or modified exhaust will not be allowed in residential areas such as, Public roads, churches, villages and private homes and camps. State law requires a maximum level of 82 decibels. It is your choice. Go by the rules or don’t go!